When we check the search engine market share, Google clearly dominates the market. At a global level, Google is expected to enjoy around 58%, while the second player is China’s Baidu with around 29% market share. Bing takes the third spot with close to 8% share. Considering Baidu is predominantly focused on Chinese market; Bing could be considered the second most preferred search engine at a worldwide level. If we consider the US market, Google enjoys around 68% share and Bing enjoys close to 19% share. We have been discussing about Google algorithm updates in the last few blog posts. A natural question that will arise is does Bing or other search engines also follow a similar algorithm update exercise and technology ? In this post, let’s try to understand briefly about these questions from Bing’s point of view! The biggest difference (read USP) of Bing when compared to Google is the integration of social element. I consider the social component to be having two parts – an active one in which enables you to login to your Facebook account and a social sidebar is activated while you do the search in Bing. You can use this feature to search for friends near your locality while traveling or ask for suggestions and so on. The passive component of social element provides Facebook results, twitter, quora, and other social platform based options in Bing search results (for example Pin It option in image search! Or showing klout or other community Q&A results in Bing search results). Unfortunately, some of these feature are not available worldwide (for example Bing tags are available only for US users). 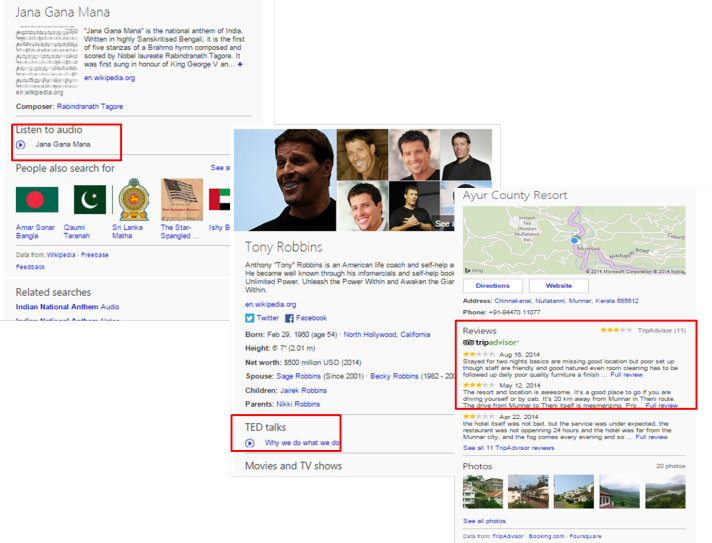 Since we have been discussing about entity search in last few blog posts; let’s try to understand how Bing compares with Google’s Knowledge Graph arsenal. Like Hummingbird, Bing powers its entity search engine with the help of a technology called Satori. 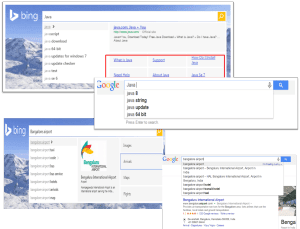 As explained in the blog post on Knowledge Graph, Bing Satori or Google Knowledge Graph tries to understand the search queries (whether person, place, thing and so on) as an ‘entity’ that has several different possible connections with other ‘entities’ in the web world. Thus ‘Mahatma Gandhi’ as an entity can be considered to be related to ‘India’ entity as the relationship – ‘Father of Nation'; related to ‘Kasturba Gandhi’ entity as ‘wife'; related to ‘Jawaharlal Nehru’ entity as a ‘Indian freedom fighter’ and so on. The beauty of Bing Satori is that it brings in the social angle. 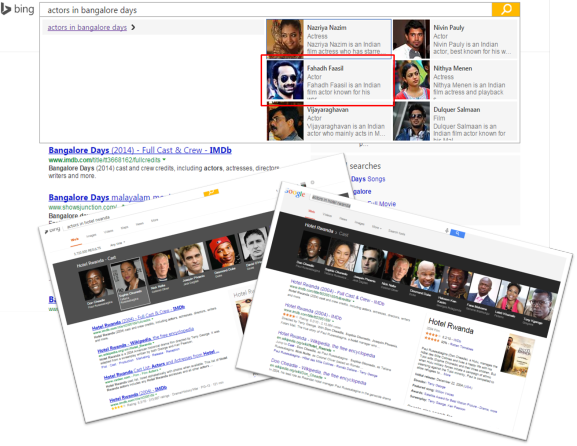 Thus you need not be a celebrity to get into Bing Snapshot as opposed to Google Knowledge Graph. 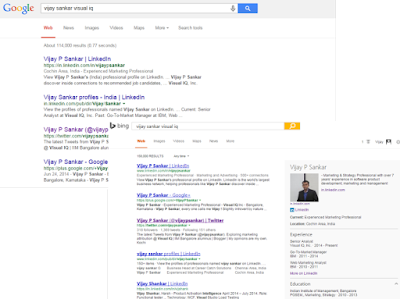 If are to look straight on between Snapshot and Knowledge Graph, both looks pretty much the same. However one cool feature I liked in Bing was, as soon as you search for something and if Bing recognizes the entity relationships, it shows a preview in the search suggest itself! Moreover, we can click on the links in preview to go directly onto an another information if that interest you more. For example, consider the search query – ‘actors in bangalore days’ below. Without looking into the actual search results, Bing offers an option to directly goto the search result for ‘Fahadh Faasil’! Here I will try to provide some examples where Bing provides a better result compared to Google. Let’s start with ‘Search Suggest’ option. Provided below is an example of a search query – ‘Java’. I am logged in to both Google and Microsoft accounts. I believe relation to Java software could be in association to my search history (instead of Java as a place!). However the interesting piece is Bing provides internal web page links in the suggest area if it understand the entity relationship! Isn’t that cool…? The Bing Snapshot is more feature rich compared to Knowledge Graph in certain situations. For example if the search query is related to audio (Eg: ‘Indian national anthem’), a link to listen is provided; similarly if the celebrity have spoken at TED, the Snapshot provide link to the talks and so on. Bing Snapshot also aims to be a true knowledge provider. For example try searching ‘dolphin’. 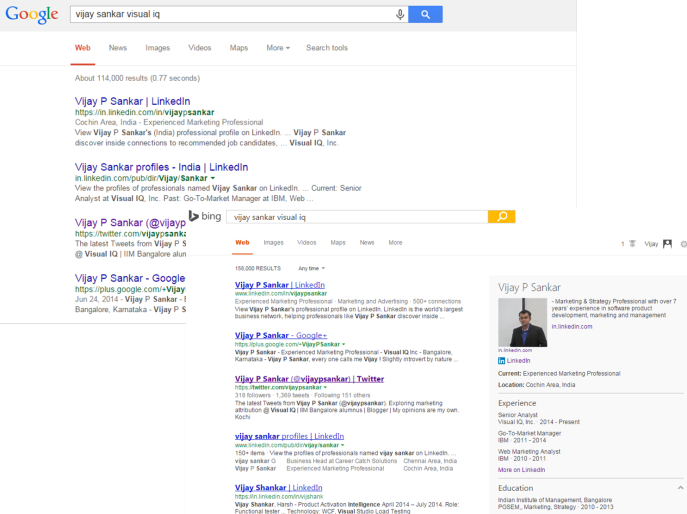 The amount of information provided by Bing Snapshot is way superior to Google Knowledge Graph!. Having said that, it fails in lot of search queries (for example , try ‘fermentation’).